In Israel religious or rabbinical courts continue to play an influential role in divorce and related matters. For example, these courts have exclusive power to dissolve marriages of Jewish spouses. So long as one spouse is an Israeli citizen –irrespective of residency – the rabbinical courts have jurisdiction to order a Get (a Jewish divorce). The rabbinical courts have joint jurisdiction – with the civil family courts – when it comes to deciding matters such as child contact, asset division and maintenance. But the court that receives the petition first will make the decisions in these crucial areas. Traditionally there was a perception that the religious courts favoured husbands over wives when making orders in divorce cases. As a result women preferred to bring property and child custody matters before the civil courts. The potential unfairness arising from this has been mitigated by several recent rulings from the Supreme Court. Religious courts must follow laws relating to certain fundamental rights, including equality legislation when dividing marital assets. In addition religious courts cannot decide child support matters without the mother’s consent. 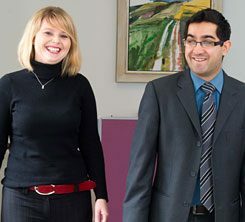 We are specialist divorce lawyers and family solicitors and we advise clients who have a connection with Israel. Our clients can include those who are UK–based but originate from Israel, are living in Israel but have a connection with England or Wales, were married in Israel, or have other family connections with Israel.